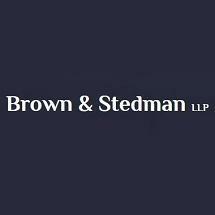 At Brown & Stedman, we make it our goal to deliver uniquely responsive legal services to each of our clients. We represent corporations and individuals in civil and in criminal defense cases. Our attorneys can deliver that level of service because they themselves have unique qualifications. Attorney Edwin B. Brown has worked with sophisticated clients in civil matters for more than 37 years. He now represents clients in their personal injury cases againt the same insurance companies he once represented. He understands how they think and puts that knowlege to work for you. We emphasize the personal delivery of our services to clients on an individual basis. We get to know you so we can craft legal solutions to your problems that are tailored to your specific needs. Ultimately, we aim to be our clients' attorneys for life. If you are looking for a law firm that provides comprehensive and personalized service from knowledgeable attorneys, turn to us at Brown & Stedman.